President Barack Obama and Japanese Prime Minister Shinzo Abe meet in Beijing this weekend at the annual Asia-Pacific Economic Cooperation forum to promote free trade and economic integration. But, back home, they may have some explaining to do. 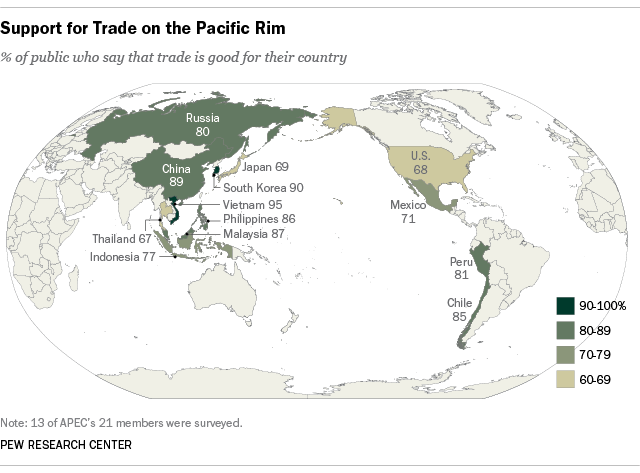 Among the 21 Pacific Rim leaders attending, they represent the publics that are most skeptical of the benefits of both trade and foreign investment, according to a Pew Research Center survey of 13 of the APEC nations. 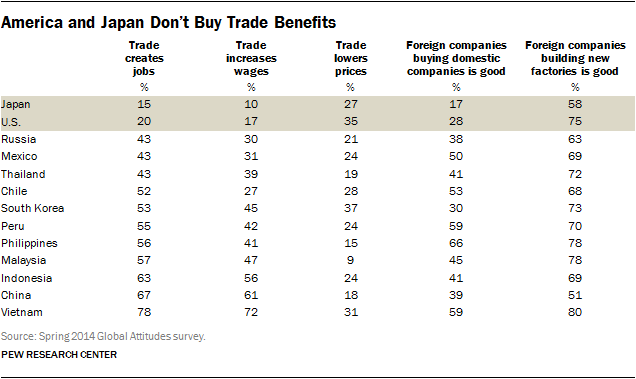 Publics in these nations believe that trade is good for their countries (a median of 81%). And a median of 53% believe it creates jobs. But Japanese (69%) and Americans (68%) are among the least convinced that trade is good for their nation. And they are far less convinced – Americans 20%, Japanese 15% – that international commerce generates jobs. Similarly, a median of 41% in the APEC nations surveyed say it’s a good thing for foreign companies to buy domestic companies in their country. Yet just 17% of Japanese and 28% of Americans share such views. With Chinese investment in the U.S. growing rapidly, this may not bode well. This skepticism in both Japan and the U.S. raises questions about political support in both societies for the Trans-Pacific Partnership free trade deal now under negotiation involving Japan, the U.S. and several of the nations assembled in China. The most enthusiastic APEC public surveyed is the Vietnamese: 95% say trade is good for Vietnam, in part because 78% say it creates jobs and 72% voice the view it raises wages. The Chinese hosts are generally supportive of trade. After a decade of exports growing by an average of 15% and wages increasing by 10% annually – what is not to like? But the Chinese are also quite wary of foreign investment: only 39% of the public there say foreign-led mergers and acquisitions are a good thing and just 51% believe foreign companies building factories in China is beneficial.